Discussions on handheld gaming are notoriously short, and for good reason: Statistically speaking, Nintendo is the inarguable victor. Having dominated the market with its DS lineup for years, the only other competitors are the PS Vita and, arguably, mobile platforms, both of which are trailing behind the empirical rule of Lord 3DS. The reasoning behind this is equally simple: Nintendo knows handhelds, and it’s been running them for decades. It comes as a surprise, then, to see Nintendo backpedal on its DS line so abruptly and awkwardly as to put even Microsoft’s growing list of acrobatics to shame. The subject in question is, of course, Nintendo’s today-announced 2DS handheld, the newest addition to the 3DS line. However, as seen in the reveal video above, the 2DS is profoundly different from its relatives the 3DS and 3DS XL in that it is entirely without 3D functionality—thus, the name. Equally important is that the physical design of the system has also been greatly altered: The inaptly named 2DS is actually one-dimensional and flat, having lost the hinged design of the 3DS line entirely. This draws an obvious connection to the tablet-inspired controller of the Wii U and suggests that Nintendo is promoting the design through the restyling. However, the crucial factor, as Nintendo itself stated, is the price point. 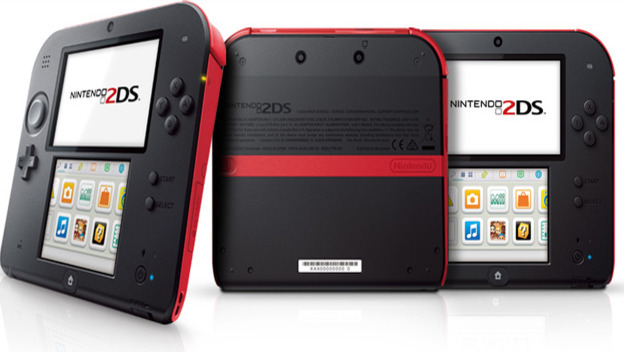 The 2DS system will retail at $129.99 and will hit store shelves October 12, 2013. Certainly, a $129.99 handheld system with access to the entire 3DS and original DS library (as the 2DS plays all DS cartridges) is a more affordable choice, and, at least on paper, a fitting reply to Sony’s Gamescom announcement of lowered price tags on PS Vita systems and memory. At least, it would be, were it not for the fact that the 2DS not only systematically deletes nearly every benefit of the 3DS line from its own architecture, but also attacks the otherwise unassailable 3DS XL. First and foremost is to address the 2DS’ ludicrous design. After the success of the 3DS XL’s larger screens, Nintendo has returned to the comparably crippled screens of the original 3DS and it wastes inordinate amounts of space in the process. The 2DS includes all the controls of a regular 3DS: the shoulder buttons, d-pad, circle-pad, touch screen, and circle buttons are all there. However, it has reorganized the button template in a way that places virtually everything alongside the upper screen. Although nobody has actually gotten their hands on the handheld yet, this layout will likely make using the lower touch screen while navigating with the d-pad—a crucial function for any menu-based game on the 3DS—an absolute nightmare, all while leaving the lower half of the 2DS a blank slate of nothing. This comes in striking contrast to the Wii U’s tablet, which makes effective use of its hefty real estate. Then there’s the removal of 3D support for games. It’s no grand secret among 3DS/XL owners that the 3D functionality itself is more of a gimmick than it is a feature. While no gamer can speak for everyone, the general consensus is that it’s a rather needless, if not outright annoying, option that, more often than not, is quickly turned off upon playing any 3D-compatible game. So, funnily enough, it is appropriate for Nintendo to cut the function entirely, in turn lowering the production cost and retail price tag. Unfortunately, the nature of the change, while cutting costs radically, has also thrown stones at the 3DS XL, Nintendo’s biggest seller. By thrusting the 2DS into the holiday market with a significantly lower price, Nintendo has created one needless intermediate of a competitor. Rather than rule holiday wish lists with an iron, 3DS XL-shaped fist, the company chose to divide its target market into the 2DS and 3DS side of things. In theory, this isn’t a major issue; it’s actually a fundamentally brilliant idea. The lowered price would be offset by increased sales, and all revenue still ends up going straight to Nintendo, and, more pertinently, not Sony’s newly discounted Vita. However, that strategy relies on one pivotal factor that the 2DS is lacking: value. Outside its prettier price tag, the 2DS does absolutely nothing new. In fact, save for playing DS games, it doesn’t do anything. Ergonomic design, larger screens, and 3D support have been thrown out the window, leaving only the barebones half-tablet dubbed the 2DS. Finally, and certainly not of least importance, is the timing of the 2DS’ launch. Nintendo has maintained a focus on November releases (presumably to help counter and feed off of the gaming surge the PS4 and Xbox One will bring), leaving October as a dry month for the fledgling system. Worse still is that, lowered price or no, the 2DS is inadvertently competing with next-gen consoles. With the PS4 sitting approximately one month away from the 2DS’ October 12th release date and the Xbox One shortly behind (or ahead? ), consumers are less likely to shell out three digits on a new handheld because the vast majority (myself included) will be busy ponying over upwards of $400 for a next-gen console. This is to say nothing of the fact that the 2DS is functionally backwards, which only further detracts from its marketability. Readers, where do you stand? Is the 2DS as worthless as it seems, or do you see a major benefit to owning one? Would you rather pick up a 3DS XL, 3DS, or 2DS this holiday? Are you still gunning for a Vita? Let us know your thoughts in the comments below.